John Deere agricultural, forestry, and industrial equipment is widely considered to be the best in the world. A reputation for reliability and innovative features have helped the company become a powerful brand name worldwide. If you own John Deere heavy equipment you will know firsthand the benefits that come from owning reliable machinery. You’ll also appreciate just how important it is to have a reliable John Deere tractor shipping service. Moving any kind of large equipment requires a high level of expertise. Your investment in John Deere equipment is significant, so you need to have confidence knowing that you’re leaving your tractor or other heavy equipment in the right hands. Whether you need a John Deere shipping service within your state, or anywhere across the nation, you can rely on the team at We Will Transport It. John Deere tractors are synonymous with reliability. Your transport company should be too! We Will Transport It is one of the most highly respected heavy haulers in the United States. With an extensive network of the best shippers, we can deliver a service that protects your investment and reduces stress and anxiety. Our shippers are fully vetted, highly trained, and 100% DOT compliant. We offer insurance (including additional insurance for the most expensive equipment), to give you protection against the unexpected. Highly trained logistics experts ensure that there are no surprises on the journey. Routes are extensively planned for safety, road law compliance, and low John Deere shipping quotes. Most importantly, we have the customer satisfaction to back up our claims. We are a Better Business Bureau accredited company with an A+ rating. Our 5-Star shipping service is highly regarded throughout America, with extensive positive feedback found on Transport Reviews. Our Google Business page is another great source of feedback where you’ll find an average 4.5-Star rating based on more than 400 reviews. If you want complete confidence that your equipment is in the right hands, you’ll love working with We Will Transport It. As highly experienced heavy equipment haulers, we can offer a John Deere shipping service for tractors and more. Whatever type of equipment you need to move, we can deliver you a solution. 4WD and track tractor shipping. 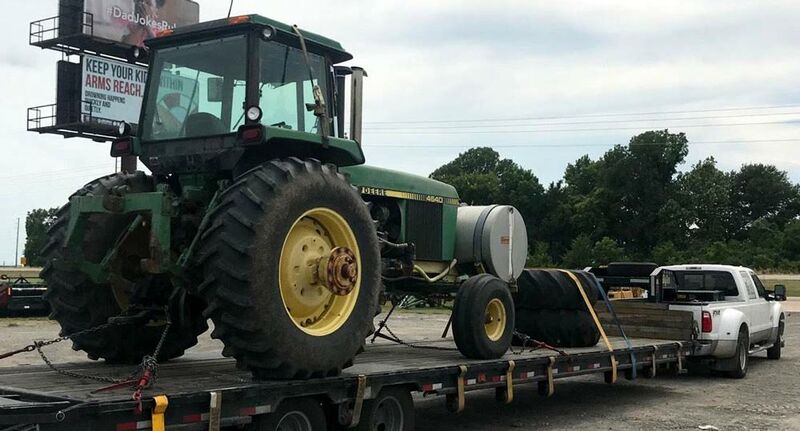 In addition to our John Deere tractor shipping service, we also offer heavy equipment shipping for construction appliances, landscaping vehicles, and forestry equipment. 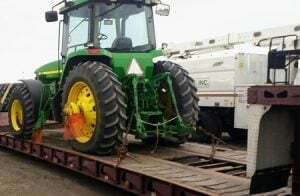 John Deere relocation by truck should only be carried by experienced professionals. There are several factors that go into a successful shipping job. Each element needs to be perfectly planned and executed to protect your equipment and meet your deadlines. Our John Deere tractor shipping service will ensure that your equipment is safely loaded and secured, protecting it throughout the journey. We can arrange for permits and other compliance documents to ensure that your tractor is legally carried through any state or local jurisdiction. Routes are selected to minimize the time of delivery. Weather and other conditions are taken into account so that unexpected setbacks do not occur. Throughout the John Deere tractor shipping service, we will remain in communication so that you can ask questions or address any of your concerns. Delays outside of our control (inclement weather, road closures etc.) will be quickly communicated to minimize inconvenience on your end. We can also arrange for storage in your destination city, making the process simpler and more convenient. If you demand a true 5-Star shipping service where you are treated like a VIP, it’s time to talk to the team at We Will Transport It. Speed up your John Deere relocation by truck and get a quote from the industry’s best heavy equipment transporters. Our extensive shipping network and expert logistics result in competitive John Deere shipping quotes that can save you money. Your John Deere tractor model and year of manufacture. Gross weight of your tractor. Complete dimensions, including length, width, and height. Whether you are hauling John Deere state to state or within your own city, we can help.